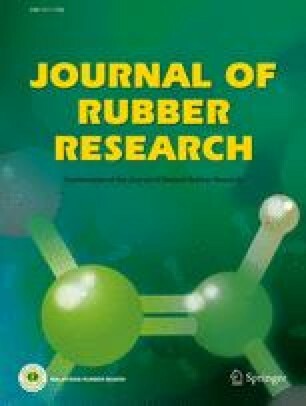 The molybdenum contents of natural rubber (NR) latices from five clones of Hevea brasiliensis were determined and ammonium molybdate solutions were added into concentrated NR latex to evaluate the effects of molybdenum ions on the colloid stability of NR latex. Molybdenum ions in NR latex decreased the mechanical stability time (MST) to 682s from 703s even though the molybdenum loading was as low as 0.02 mg/kg and standing one day. The ζ potential of NR latex was reduced to 38 mv from 43 mv when the molybdenum loading was 0.16 mg/kg and standing 30 days. The average size of NR particles was reduced after adding molybdenum ions into NR latex. The adding molybdenum ions in NR latex increased the crosslinking density of vulcanised latex films to 9.86×10−5 mol/cm3 × from 9.2×10−5 mol/cm3. Molecular mass between adjacent crosslink points was decreased to 9.64 kg/mol from 10.47 kg/mol. When the loading of Mo ions is 0.16 mg/kg, the tensile strength of vulcanised latex film was increased to 26.73 MPa which was about 1.76 MPa higher than that of the control sample but it exhibits a negative influence on the antioxidative behaviour of vulcanised latex films.